-Does not contain harmful acids, safe and easy to use. -Quickly removes stains from water line. -Excellent for use on fiberglass, metal and painted surfaces. -Instantly Removes Stains From Grassy Marine Growth, Rust, Scum Line, Fish Blood Etc. Shake well. Apply using sponge or sprayer. Use of rubber gloves is recommended. Allow to remain on surface for 2 minutes then rinse with fresh water. Severely stained or dirty surfaces may require second application. For best results, use when temperature is over 50°F. 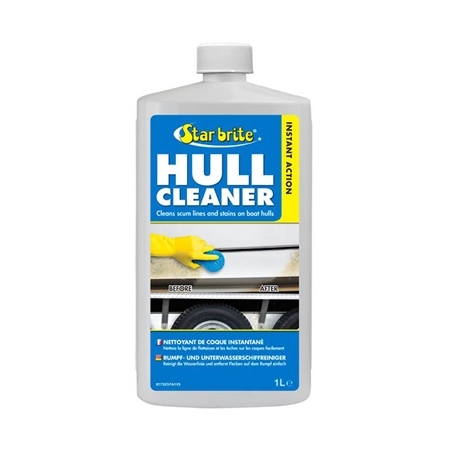 To shine and protect newly cleaned hull, apply any of Starbrite's Marine Polishes.